As LACMA turns 50, the museum's director helps usher in an ambitious expansion. I have always had a special relationship with the Los Angeles County Museum of Art. I often visited growing up and eventually worked there for several years—before the tenure of its current director and CEO, Michael Govan—when LACMA was a sleepier place. Back then, when I would ask other Angelenos to visit the museum, they had a hard time distinguishing between “the one downtown” (meaning the Museum of Contemporary Art) and “the one near the Tar Pits” (LACMA). Today it’s a different story. During his decade at the helm, Govan has elevated the museum’s profile. He has spearheaded projects such as the hugely popular outdoor plaza with Chris Burden’s “Urban Light” (2008), a temple-like arrangement of restored street lamps from all over L.A. that has become a nighttime destination for people visiting the city, and Michael Heizer’s “Levitated Mass” (2012), a 340-ton boulder that was transported by truck to LACMA through three countries. Now Govan has plans to raze much of the museum’s original campus (at a price of more than $750 million) for an ambitious and controversial design by Swiss architect Peter Zumthor, which is scheduled for completion in 2023. When we met, I asked Govan about former Univision chairman and CEO Jerry Perenchio’s remarkable announcement on the 50th anniversary of the museum to gift LACMA a massive collection of 19th and 20th century masterpieces. The offer came with a big string attached: the museum must complete Zumthor’s building before it gets the works. He wondered if I was skeptical about the plan’s scope, which has spurred debate. Govan’s vision for a “non-hierarchical culture space” feels very L.A.—as the home of glitter, the city’s cultural ambitions are not snobby. He also acknowledges the relevance of the ancient in modern life. We also discussed the city, his approach to patronage, and the role of museums in our accelerating culture. How did Jerry Perenchio’s gift come to be tied to the Zumthor plan? The core of an art museum is its collection. Not only is that what people see, but it’s what you trade with other museums through lending arrangements. The Perenchio gift was the big objective in terms of Modernist painting and sculpture. When I first spoke with Jerry, his first question was: “Where do the works go?” I told him that we were serious about Zumthor’s plan, and that I thought the county would support us. 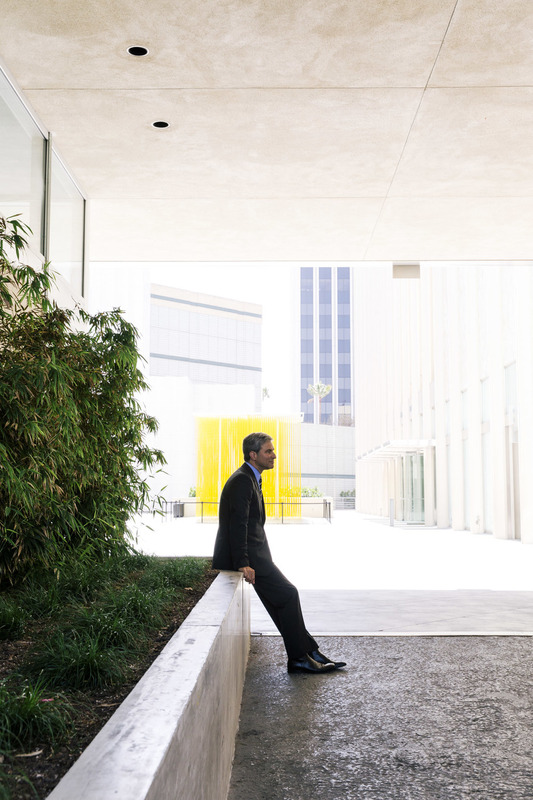 He said, “Okay, then I’m serious.” The building is what made him realize that there would be a proper place to leave the works in Los Angeles. You called Zumthor’s proposal a worthy risk, when most museums aren’t taking risks. It’s a very measured, thoughtful risk. The Zumthor project is actually about sublime accessibility. Everyone else wants to say these two ideas are opposed. Not me. What makes the plan sublime is that it’s so accessible. With smaller projects, it’s difficult to shift attitudes and infrastructure in favor of cultural philanthropy. So the vast scope of the project is in some ways strategic because it will help orient the community toward the museum. It has to be perceived as valuable and exciting, and I think that can happen. I do feel this shift happening now, and maybe I’m a little close to it, but it’s going to happen. I’m curious how people responded when you told them you were moving to L.A. There was a lot of skepticism from friends in New York who think that’s the cultural center of the universe. But I came to L.A. with great optimism because it’s a metropolis with generations of artists and creativity. The Hammer was doing really well, and MOCA had an amazing history. But who was the leader to look up to? It seemed like LACMA was in the target zone. I told the board it was imperative to raise the bar, and they’ve created that leadership. Since you’ve arrived, the museum has added close to 10,000 works to the collection and attendance has almost doubled. LACMA always seemed to have low attendance relative to the city’s scale. My first weekhere it was pouring rain. I was at the Grove [shopping mall] and thought, “It’s still full of people outside, spending money; there’s this great mix of people and a sene of community.” That gave me confidence to open things up. Being outdoors, it’s also easier for people to make the decision to go to LACMA. Maybe first the hang outside at one of the museum’s “Latin Sounds” concerts, and then pop inside. Is the museum’s “Art + Film” initiative an effort to bridge figures from the entertainment world to the arts? The rap on L.A. is that it lacks cultural philanthropy. It’s true that it’s harder to raise money for museums in Los Angeles than in other big cities. We’re a young city, and there isn’t multigenerational philanthropy like in New York. But that doesn’t predict what you can do in the future. There was this rift between the art-cultural world and the movie world, but I think that we’ve tried to show that they’re ultimately compatible. This is an entertainment town after all. Cinematic art is art, and that’s what makes Los Angeles feel different. When you google “LACMA 50th anniversary” photos from the star-studded gala come first. Do you wrestle with how best to relate to celebrity culture? In the world I come from, the huge celebrities are John Baldessari, Ed Ruscha, Barbara Kruger, David Hockney…But that doesn’t mean you have to discount other peoples’ accomplishments. Movies and television communicate more broadly. IF we didn’t have a balance between the wide communication of movies and television, and the narrower one of the visual arts, I think we have a lesser world. They can coexist. The Art ­­+ Film gala was all about making it natural and easy for people from these different worlds to talk to each other, learn about art, and learn about film. The further away you are, the more complicated celebrity is. In L.A., Leonardo DiCaprio is at the museum all the time. He sits in the café with friends and visits the galleries, and then he shows up at the gala. Is L.A. more difficult than other cities in terms of patronage? L.A. has the cult of the individual more strongly than other cities, but what it’s not so good at is the collective. If you get too far into the collective, you miss the experimentation and unruliness of the individual and you can become ossified But if you’re too focused on individual expression, you can miss the opportunity to create community. There has to be a balance. L.A. is starting to move more in the direction of community. 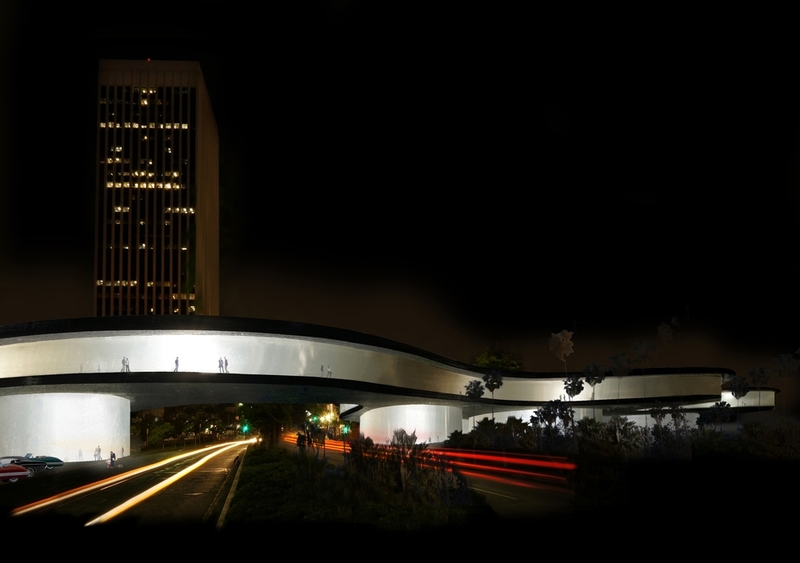 You’ve timed the Zumthor expansion to the opening of L.A. Metro’s expanded Purple Line. Was this to give everyone somewhere to go? The subway is a game changer. Frank Gehry always said that L.A. has no city center: It has a line, and that line is Wilshire Boulevard. It connects downtown and the ocean, and we’re in the middle of it. My dream—a sort of secret and not-so-secret plan—is to move LACMA into the communities more physically and permanently through collaborations, and even through physical space. One idea is to run programs wherever you have an off-site storage location. That’s potentially in our future. You say that Zumthor addresses the idea of the sublime in art. Sacred and profane has been ingrained into us as a dichotomy, with the museum on one side and pop culture in the other. But L.A. is the place to indulge both. Obsessing about the hierarchies of better and worse is less interesting than marveling in the power of creativity. I don’t see any contradiction between having people taking their selfies on the plaza, and then coming in, slowing down, and contemplating a 16th-century Ardabil carpet—the greatest Persian carpet in the world. The great thing about an encyclopedic museum is that all of this coexists. Do museums offer a counterpoint to accelerating culture? I believe that Peter Zumthor is one of the few architects who can bring you to this other space of contemplation. A museum should elucidate the idea that there are many ways of seeing things. Any experience of a work of art is dependent on so many things: the frame, the lighting, the weather, what state of mind you’re in, how you arrived there. That affects how you read things. Robert Irwin, or any artist involved in perception, can teach you that. Talk about the pressure of the institution. What keeps you up at night? Institutions have to answer to a lot of stakeholders: our public, our donors, the country, and a staff that is large and smart. Everybody has an opinion, so there’s pressure to make a lot of people feel that you’re doing a good job serving their needs and those of the community. Big public museums are also starved for money given what they have to accomplish, from serving their needs and those of the community. Big public museums are also starved for money given what they have to accomplish, from serving the public though educational programs trying to acquire art for future generations. You have all the donors who want their gifts maximized, and through the county you’re also accountable for taxpayers’ money. Everybody wants magic. They want attendance and they want poetry. What advice would you give a prospective museum director? Think twice. I found myself in this position by accident. It’s very rewarding, but it’s also grueling and all consuming. What about advice for collectors who are thinking about building their own museum? People vastly underestimate how much money it takes to sustain a cultural institution. In the future, we will see a consolidation of art museums and cultural institutions. If you look broadly, statistically there is not enough endowment and capital to keep it alive all the cultural facilities that have proliferated in the last 30 years. Do you think that museums need to do more to investigate other ways they can make revenue? That was a big trend in the 1990s and early 2000s, but most of it didn’t pan out. We’re just not as good at straight business as we are at creating enormous value through art and education. It’s a lot more efficient for one my trustees to make a large amount of money through movies, videogames, farming, or whatever, and then give it to the museum. I rely on the fact that wealth will be created in the communities and will then go to the public through the museum. What we have to do is build the best, most attractive possible vessel so that people will feel like they’re seeing great value in their contribution. If you’re not dreaming in this business, then you’re not doing your job. Imagination is the key to our survival as a species, and it’s what art is about. If a patron offered you $1 billion for a dream project, what would it be? LACMA. The potential here is much greater than I ever imagined. There’s no other place like it: the multicultural audience, the creative community, the weather, being on the Pacific Rim. You’re on the edge. I can’t imagine anything better than investing in what’s going on right here. This interview is running in Surface’s American Influence issue. Michael Heizer has been enormously influential on your spirit and thinking. Who else? Chris Burden had a very American way of looking at things—that kind of civic community idea. Robert Irwin is a Californian-American artist in a big way, too. So is James Turrell. And Barbara Kruger, with her interest in pop culture and magazine culture. You never get rid of influence. It’s what makes the future.